Traditional fiddling has an excitement and raw energy that is unique and Gordon McLeod captures that energy and magnetism like few other fiddlers. As well as being a renowned fiddler in the heart of fiddle country (Texas), Gordon is known as an award winning songwriter, multi-instrumentalist, and vocalist. Although he has played most genres of music at one time or another, his favorites are traditional Irish music and Gypsy swing in the style of Django Reinhardt and Stephane Grapelli. (Check out Gordon's 2013 release "Daddy G and His Amazing Swingtet"!). On "Just Fiddlin' " Gordon offers his first solo recording in Irish fiddling although he has been performing traditional Irish music as a member of the well known band Beyond The Pale as well as The Aisling String Trio and with the Trinity Hall Session Players for many years. He is joined on selected tracks of "Just Fiddlin' " by some of the greats of Irish traditional music including Matt Cranitch , Donal Murphy, Niall Murphy , Christy McLeod, David Lovrien and Allison Hicks. Most of the tunes included on this CD are traditional Irish dance tunes and the rest are original tunes more or less in that same style. Track 1--Paddy Cronin's/The Toormore/Padraig O'Keefe's Favorite-- These are three slides, a type of jig unique to the Sliabh Luachra tradition. Gordon is joined on this track by the renowned Irish Fiddle Master and scholar of Sliabh Luachra music, Matt Cranitch from County Cork. Matt is well known for his work with Sliabh Notes, Na Fili and now with Jackie Daly. Gordon learned these slides from Matt and they are included in Matt's most recent tunebook Irish Fiddle Tunes (Schott Music Ltd.) Gordon says of this track " I am honored to be playing on this track with Matt who has been such a good friend for many years and a huge influence on my Irish fiddling. Matt has been a great mentor and I thank him heartily for helping with this project." Gordon plays fiddle and guitar and Matt adds his masters touch on the fiddle. Track 2--Donald Blue/Top of the Morning/Jenny's Wedding--Three reels Gordon learned from playing in countless Irish sessions. The second tune is also known as " Micho Russel's" after the expert whistle player from Doolin, County Clare. Jenny's Wedding is a well known uillean pipe tune made famous by Liam O'Flynn. On this track, Gordon plays fiddle and guitar. Track 3-Australian Waters/The Bank of Turf--two jigs. Gordon learned the first tune from Siobhan Peoples at the Willie Clancy Summer school in Miltown Malbay , County Clare, Ireland in 1996. The second is a well known session tune much played in the Dallas area sessions. Gordon plays fiddle and guitar on this track. Track 4--Donal and the Buffalo--Gordon composed the tune "Donal and The Buffalo" after dreaming of Donal Murphy (well known master Irish accordionist) playing it while Gordon was asleep one night in his tent at the Old Settlers music festival near Austin. Donal is an All Ireland accordion champion and well known for his work in Sliabh Notes, Four Men and a Dog and now Breaking Trad. Gordon says " Donal , who is such an awesome musician, adds power and grace to this lively Cajun flavored tune. Not only was Donal kind enough to record an accordion track for the recording of Donal and the Buffalo, he even persuaded his sidekick Niall Murphy (all Ireland fiddle champion, and fantastic player) to lay down a killer harmony fiddle track. Also, Christy's guitar playing on this track is just spot on and makes you want to dance all by itself. I should add that she recorded it in one take!" Gordon plays fiddle , guitar, bass, octave mandolin and bodhran. Track 5--The Gullane/The Blackwater Polkas--These three polkas were learned by Gordon from Matt Cranitch and Jackie Daly from their performance at The O'Flaherty Irish Music Retreat near Dallas in 2012. Matt joins Gordon on fiddle for a duet . Matt is the soloist on the third tune and Gordon plays the lower octave on the fiddle on the second tune and plays guitar throughout.. These polkas are classic Sliabh Luachra polkas in the lively style of that region. Track 6--Jocelyn's Waltz--Gordon learned this beautiful waltz directly from the composer, the renowned Tommy Peoples (The Bothy Band) in a workshop at the Willie Clancy Summer School in Miltown Malbay, in 2000. Gordon plays fiddle and guitar. Track 7--Patsy Geary's/ Art O'Keefe's/ The Kings of Kerry--Three slides. Gordon learned the first from John Delaney of Beyond The Pale as a jig and later from the playing of Cathal Hayden , the wonderful fiddler of Four Men and a Dog fame, as a slide. Art O'Keefe's was learned from Matt Cranitch and The Kings of Kerry (composed by Sharron Shannon and Mike Scott and Steve Wickham of The Waterboys) from Clare Cason. Gordon plays fiddles, guitar, and bodhran. Track 9--Fiona's/Sean Ryan's -two hornpipes done in a swing style. Gordon composed "Fiona's " in honor of the birth of Patrick and Sheila Thurmond's daughter, Fiona in the late 1990s. "Sean Ryan's" was learned form Nicky McAufliffe in Miltown in 1998. Gordon plays fiddle, guitar and bass. Track 10--The Coolea/Gusty's Frolics--Two jigs, the first a well known session tune and the second learned from Oisin McAuley at the O'Flaherty Irish Music Retreat near Dallas in 2013. Gordon plays fiddle , guitar, octave mandolin, and piano. Track 11-Johnny O'Leary's/Din Tarrant's/ Kelly's--Three Sliabh Luachra polkas. The first learned from Clare Cason, a world class classical violinist, teacher , Irish fiddler and dancer from the North Texas area. The second tune Gordon learned from the playing of Donal Murphy and the last tune was taught to Gordon by Melanie Murphy in the Murphy home in Abbeyfeale, County Limerick in 2011. Gordon says "I had the great pleasure of performing this set with Sliabh Notes during one of their concerts at The North Texas irish Festival in 2013. Tommy O'Sullivan, their wonderful guitarist and good friend played a fantastic quasi rock and roll rhythm to Kelly's".Gordon plays fiddles, guitar, synth, and bass. 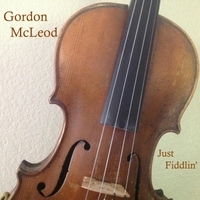 "Just Fiddlin'" was produced and recorded by Gordon in his studio, "McLeod Nine Studio" near Dallas, Texas.